Is minimalism meets high-tech your sweet tooth in design? If the answer is yes, then you’re in for a treat in Lisbon. 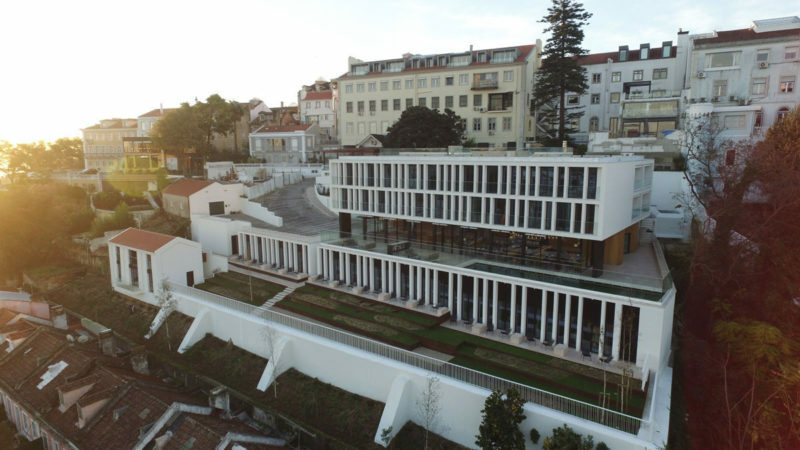 Meet Memmo Principe Real, the flagship property in the Memmo Group of Hotels in Lisbon. The hotel, in its own private entry and enclave, is as cool as they come. From the moment you descend the private entrance to a large parking area and driveway, and are confronted with the super swanky hotel, you know you’re in for something special. Staff are all smiles here and eager to help you out, as well as enjoy your experience. Upon entering our room we were immediately offered a welcome cocktail which consisted of a DIY gin and tonic – utterly fabulous! We loved the little treats that were dotted around the room, too. 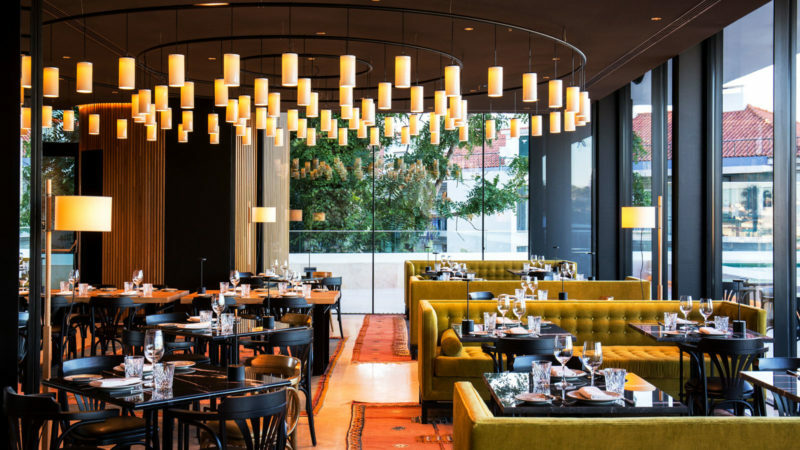 From the miniature pasteis de nata welcome tray, to the chocolate truffles hidden under a bowlers’ hat – with a suggestion the visit the quirky Pavilhao Chines in Bairro Alto. 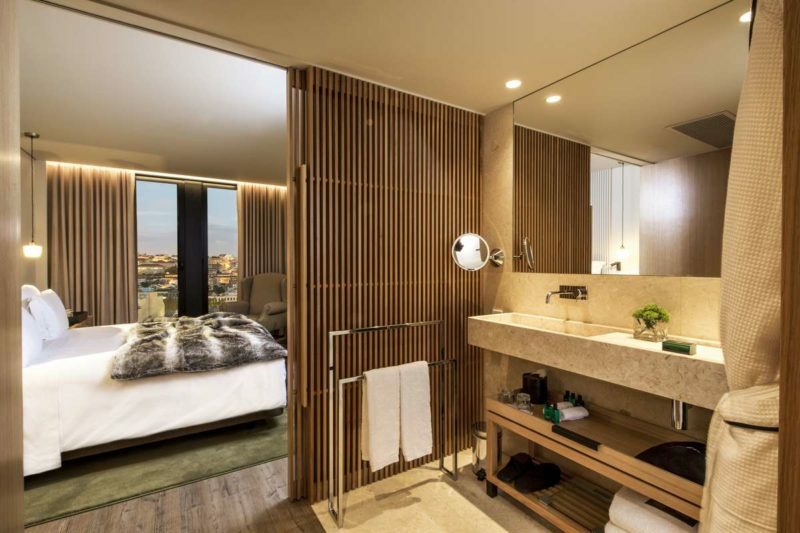 The rooms are design-heavy and compact with a fluidity between bathroom and bedroom. We loved the sliding wooden doors that compartmentalise the room: from the large doors that close off the bathroom, to the ‘hidden’ doors that segregate the walk-in closet and loo area. The beds are super comfortable with a veritable mountain of super soft and plush pillows! Inasmuch as this is a tech-savvy place, we liked the ease of the technology – a factor that is often over-complicated in tech hotels. The communal areas of the hotel are equally cool. We loved the breakfast/dining/bar area with its boisterous colours popping out at you, yet somehow seamlessly blending in. We enjoyed a magnificent feast of a breakfast on the super comfortable sofas and were only sad we didn’t have time to replicate a dinner scenario later. Location-wise the Memmo Principe Real ticks all of the boxes. In the fashionable Bairro Alto district, the hotel is close to a myriad of boutique shops, cool eateries and beautiful side streets. On any given night, the Bairro Alto area will be alive with people enjoying the city and sipping on sumptuous cocktails. The best thing about Memmo Principe Real? It has its own private entrance off of Rua D. Pedro V, allowing you to escape from the madness at any given time, into your own private sanctuary.